Mounir Ghogho received the PhD degree in 1997 from the National Polytechnic Institute of Toulouse,France.He was a Research Fellow with the University of Strathclyde,Glasgow, from September 1997 to November 2001. Since December 2001, he has been a faculty member with the School of Electronic and Electrical Engineering at the University of Leeds (UK), where He currently holds a Professor/Chair in Signal Processing and Communications. 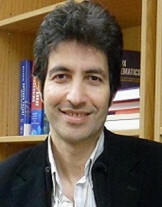 He is also currently a Professor at the International University of Rabat. His research interests are in signal processing and communication networks. He has published 3 book chapters, 70 journal papers and over 140 conference papers. He was awarded the five--‐year UK Royal Academy of Engineering Research Fellowship in September 2000. He is one of the recipients of the 2013 IBM Faculty award. He served as an Associate Editor of the IEEE Signal Processing Letters from 2001 to 2004, the IEEE Transactions on Signal Processing from 2005 to 2008, and the Elsevier Digital Signal Processing journal from 2011 to 2012. He served as a member of the IEEE SPCOM Technical Committee from 2005 to 2010, a member of IEEE SPTM Technical Committee from 2006 to 2011, and is currently a member of the IEEE SAM Technical Committee. He was the General co--‐Chair of the 21st edition of the European Signal Processing Conference (EUSIPCO 2013) and the 11th IEEE workshop on Signal Processing for Advanced Wireless Communications (SPAWC 2010), the Technical co--‐Chair of the MIMO symposium of IWCMC 2007 and IWCMC 2008. He held invited scientist/professor positions at many institutions including the US Army Research Lab (USA), Télécom Paris--‐Tech (France), National Institute of Informatics (Japan), the University Carlos Third of Madrid (Spain), Technical University of Darmstadt (Germany), the University of Minnesota (USA) and Beijing University of Posts and Telecommunication (China).